Icebox cakes are perfect for summer! 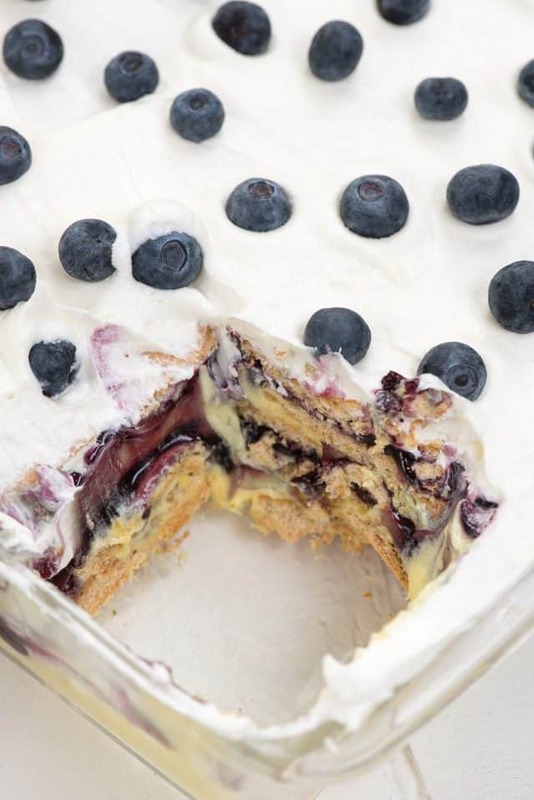 This Blueberry Lemon Icebox cake is a no-bake dessert lasagna filled with lemon pudding and blueberry pie filling, sandwiched with graham crackers. Thanks to the sponsorship of Almond Breeze and making it dairy-free! 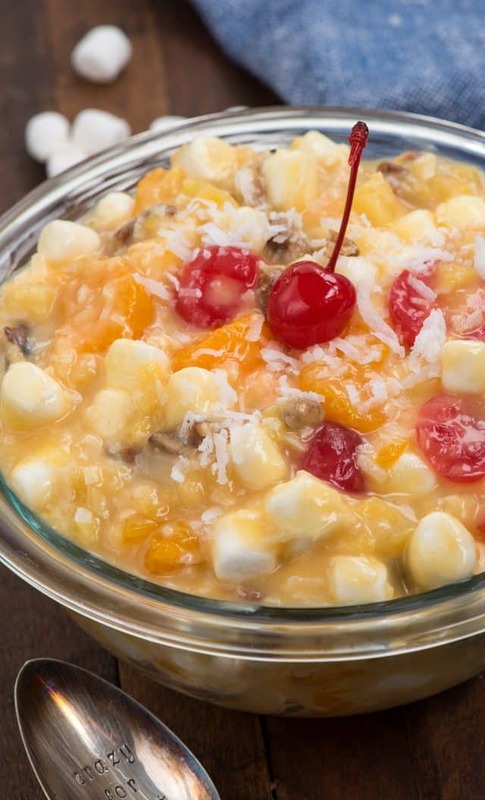 This dessert screams summer to me, doesn’t it? The bright yellow of the lemon pudding, the blueberries and whipped topping; it all combines to a summery flavor profile. I think I see summer when I look at it because I know it’s no-bake and I live for no bake desserts in these hot months. It was triple digits here before the end of June, making me not even want to use my oven or stove. Heck, I don’t even want to turn on the lights in my house! Lemon is such a great flavor all year long, but I especially love it in spring and summer. No-bake lemon desserts are actually my favorite ones to make (and eat)! When I was thinking about what I could use with a box of lemon pudding, I immediately thought about an icebox cake. As the icebox cake sits, the wafers get soft and the end result was an easy dessert that tasted like cake with whipped cream frosting. Over time, icebox cakes have evolved. 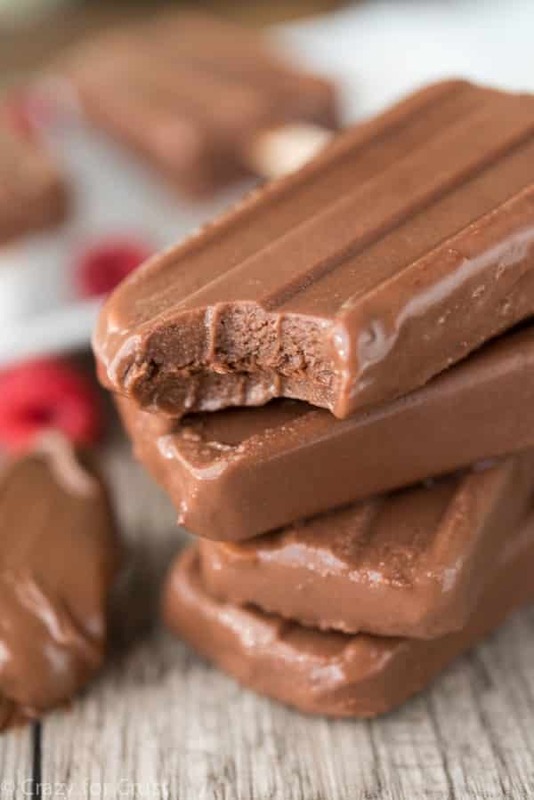 You no longer need to use chocolate wafers. You can make an icebox cake out of any cookie or graham cracker. Whipped cream has given way to whipped topping because it’s dairy-free and more stable, and filling flavors have changed too. Key lime, peanut butter, you name it, you can make it an icebox cake. This dessert isn’t just known as an icebox cake, however. You can call these layered desserts so many things: Dessert Lasagna, No Bake Lush, or Dream Dessert. No matter what you call it, these layered no-bake desserts are easy to make and taste so good. This version is full of lemon and blueberry flavor with graham crackers and whipped topping. It’s heaven in a casserole dish! No Bake Blueberry Lemon Icebox Cake is an easy no bake dessert lush made with lemon pudding and blueberry pie filling. It’s a go-to summer dessert! The best part about this no bake dessert is that you can easily make it dairy-free by making your pudding with Almond Breeze. I love using almondmilk in my pudding; it creates a rich and thick pudding with a little extra flavor. You can use whatever flavor Almond Breeze in this dessert, but I used Almond Breeze almondmilk Unsweetened Vanilla. It’s what I always have in my refrigerator to use on cereal or in smoothies or when I make cake or pancakes. Making a graham cracker icebox cake with pudding, whipped topping, and blueberry pie filling is perfect for summer! Graham crackers make the “cake” in this dessert. There are 5 layers of graham crackers. Make instant lemon pudding with Almond Breeze almondmilk and layer it with the graham crackers and a can of blueberry pie filling. Cool Whip fluffs up the lemon pudding and tops the dessert. To turn this into an icebox cake, chill it at least 3 hours before slicing. The graham crackers get soft and will taste like cake mixed with the pudding. Can you freeze icebox cake? Yes. Cover it with plastic wrap and freeze, but let it defrost in the refrigerator before serving. 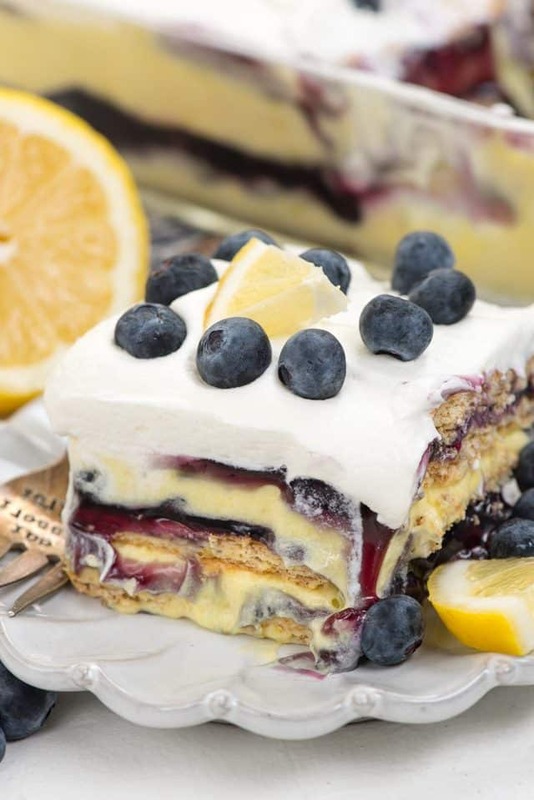 Blueberry Lemon Icebox Cake is the perfect no-bake dessert! 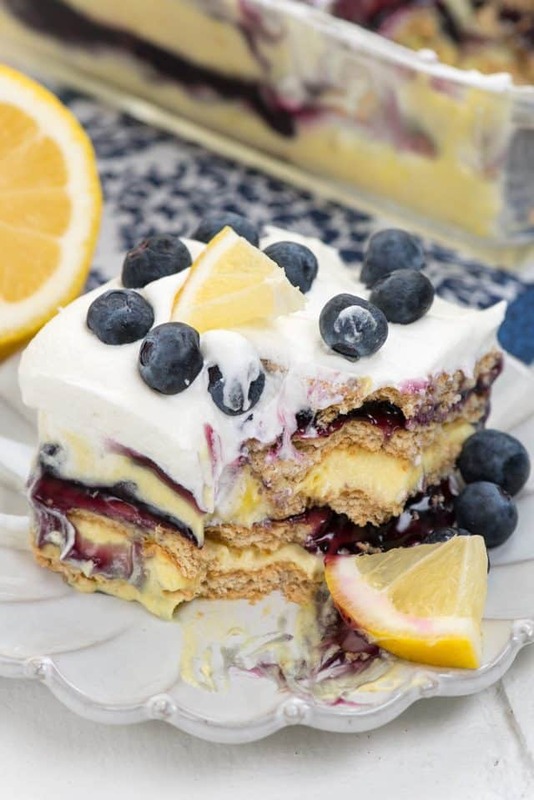 Lemon pudding is mixed with blueberry pie filling and layered with graham crackers. This cake is everyone's favorite summer lush dessert! Whisk pudding mix and almondmilk. Let set 2-3 minutes or until thick. Fold in half the Cool Whip. Place about 4 1/2 graham cracker sheets in the bottom of an 8x8-inch pan. Top with half the lemon pudding mixture. Layer another 4 1/2 graham cracker sheets on top the pudding. Top with half the blueberry pie filing. Repeat both layers of pudding and pie filling. Add one more layer of graham crackers. Spread the remaining Cool Whip over the top. Chill at least 3-4 hours or overnight. The crackers will soften as it sets. Garnish with blueberries before serving. Store in refrigerator for up to 3 days. 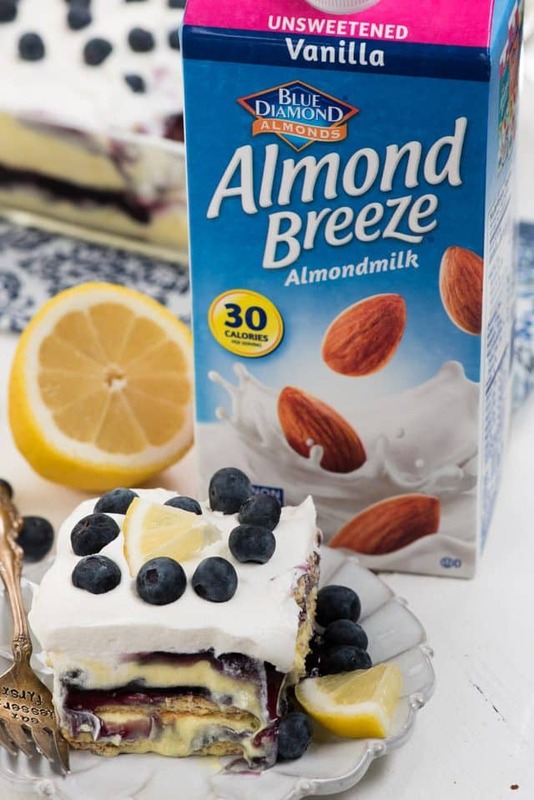 Be sure to check out all of my recipes made with Almond Breeze! This post was sponsored by Almond Breeze. All opinions are 100% my own. … while typing to see what’s new, I already knew I’ll be fascinated ! This looks amazing! And “icebox cake” just sounds so vintagey and cool to me. I feel like I have a million fall/winter desserts, but need to ramp up my go to summer no bake selection. So with you that the oven stays off — I’m in Illinois, but we’ve been having a weird jungle-tribute summer. Can’t wait to try it! Hey Dorothy, this looks awesome. I have always wondered about making pudding with a milk alternative. I tried it once with soy milk and sugar free pudding and it never got thick. I thought it was because there was something in dairy milk that made it get thick. Have you ever tried this recipe with sugar free instant pudding? Before refrigerators, “back in the day”, there used to be large insulated metal boxes in kitchens to hold perishable foods, (These were very similar to the milk boxes on our front porch for the milk man to deliver milk daily.) The ice man delivered a block of ice to the house to place in the this “ice box”.